After an unusually cold and dry start to spring, the weather in New England did an about-face. Average daytime temperatures rose from the mid to high 50s to the mid 60s from the middle of April to the first of May. The following weeks a perfect weather pattern delivered the right amount of rain to complement the warm weather and sunshine. During this brief period the “flats,” as they are called in this valley, came alive as professional farmers and Kolp gardeners went into overdrive preparing their fields and gardens for planting. It didn’t take long for the fertile valley soil to begin producing early vegetables: radishes, broccoli, lettuce, kale, spinach, and peas. Warm weather vegetable seedlings like beets, summer squash, tomatoes, and corn were starting to appear in many gardens by early June. All of the professional farmers were mowing the fully-developed winter rye in their fields in preparation for drying and baling. In the middle of all of this productive activity, the meteorologists began forecasting a dramatic change in the weather pattern. Weather computer models were showing an extended pattern of thunderstorms and heavy rain for most of the East Coast. All of this wet, unsettled weather was headed straight for Connecticut and the Farmington Valley. This type of forecast is very disturbing to the folks in this state, especially those living near rivers like the Farmington River. This paranoia over heavy rain during the summer months goes back to at least August of 1955 and perhaps before that. 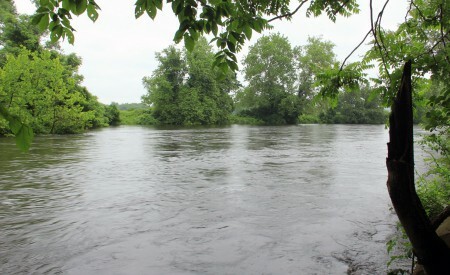 In 1955, the 81-mile-long Farmington River was one of three rivers in the Connecticut River Valley that overflowed its banks after receiving more than 20 inches of rainwater from two hurricanes, Connie and Diane, in less than two weeks. During this disaster 77 lives were lost and 350 million dollars in damage was suffered in Connecticut. 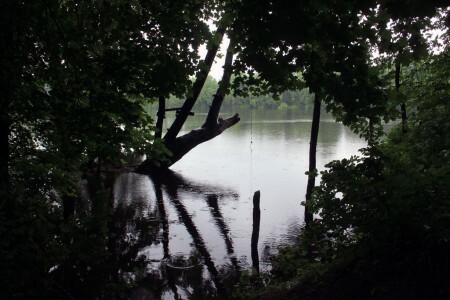 In August of 2011 Hurricane/Tropical Storm Irene dumped about 4 inches of rain in the Farmington River, causing it to overflow its banks. 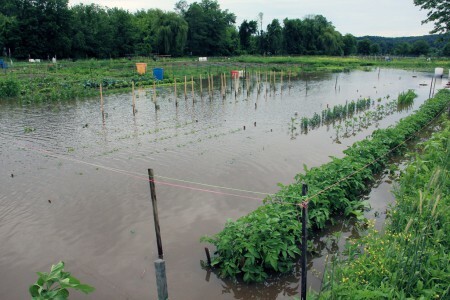 This flooding dumped contaminated water on the “flats,” destroying the crops of both professional and Kolp gardeners. Now another weather pattern consisting of most of the rain and wind elements that have marked previous flooding problems was headed in our direction. Since much of the Farmington Valley is flood plain, especially this area, all we could do was wait and worry. 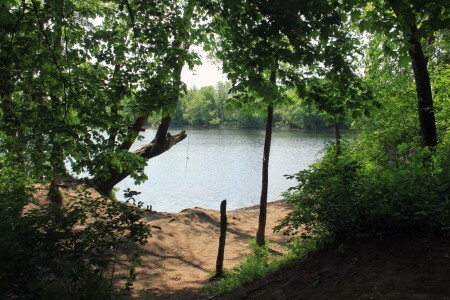 The Farmington River flows just 10 feet behind those trees on the right side of the first photo below. Since I have included more photos in this post than usual, I will limit my commentary to basic information about each of the photos below. 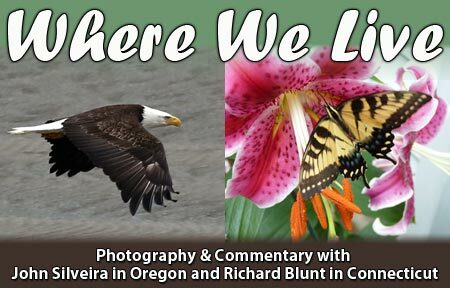 I have, in past posts, provided a great deal of information about the gardens and the folks that plant and maintain them. If this is your first visit to this site, you can access these past posts by clicking on one of the related categories or on a date in the archives. Both sections are located on the right side of the page. A view of the gardens in early May. 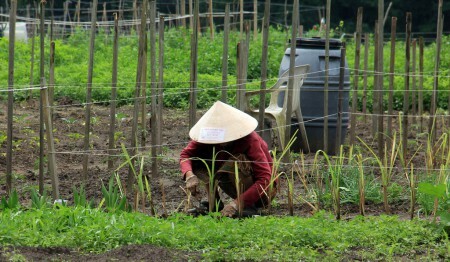 Both farmers and gardeners were busy planting and looking forward to a long and productive growing season. This photo was taken a few days before it began to rain. 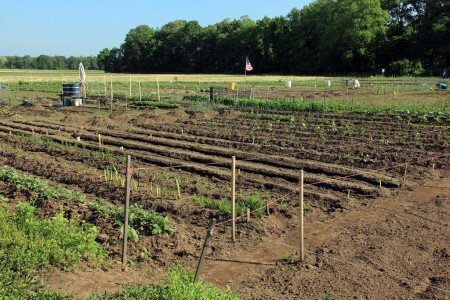 Nearly all of the gardens were planted with early season crops at this time. 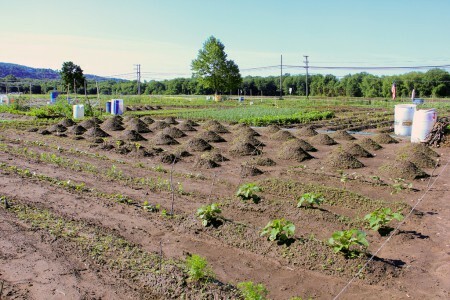 This is a shot of Terry’s early planting, taken the same day as the one above. This is the garden being planted and maintained by Cub Scout Troop 170 of Unionville. They are being advised by a local master gardener. This plot is planted and developed by Girl Scout Troop #66126 of Unioville. 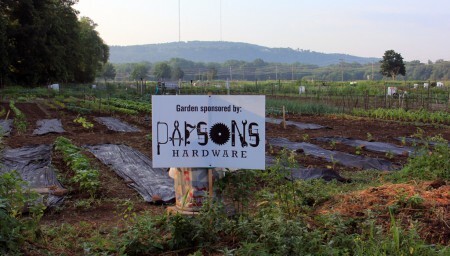 This local hardware store is helping them with the expense of planting and maintaining this garden. The sign was the idea of the Troop as a way of expressing gratitude for the support. Most of the businesses in this town contribute to the welfare of the community. Over the past 20 years, when I can’t find something in a big-box store, I come to these folks, because have it in stock. If it is not, they will find it for me in just a couple of days. If I need advise on how to proceed with home project, I can always find it here. 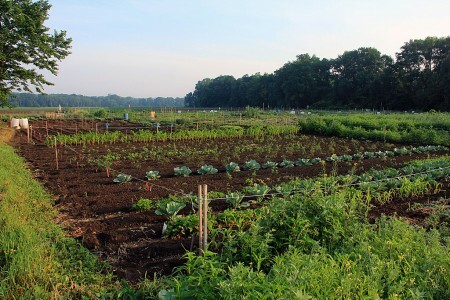 The vegetables grown in both Scout gardens are donated to the local food pantry. They are also in competition to see which troop will grow and donate the most during the growing season. 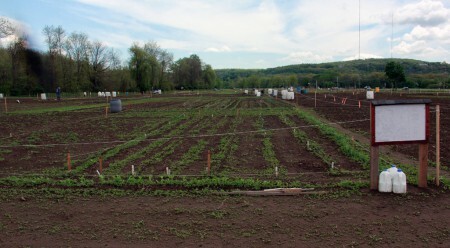 Krell Farms was the first of the professional gardens to plant corn this season. These folks maintain several fields around Farmington, and at least one field in a neighboring community. The complete list of high-quality fruits and vegetables grown by these folks is far too extensive to list here. But it does include: corn, cucumbers, tomatoes, potatoes, summer and winter squash, pumpkins, strawberries, and a variety of fresh herbs. 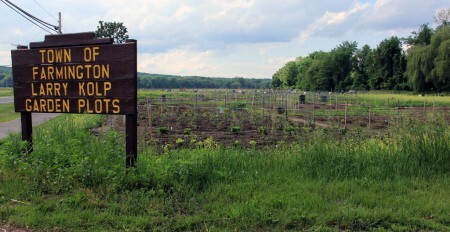 They also sell first-class hardened-off seedlings at their farm stand. Impressive when you consider that this is a family operation. Farming doesn’t get any better than this. 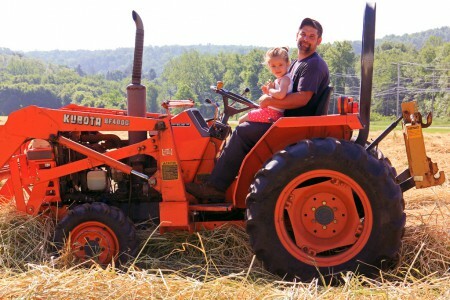 This is Matt and his daughter preparing cut and dried rye grass for baling on a warm, sunny day early in June. Matt represents Eaton Farm, another one of the professional farms in the area. This was a busy day on the “flats.” Two other farmers were also working their fields. The green tractor belongs to Krell Farm; the yellow bins on back are full of corn seeds for planting. In my April post I introduced you to a male Horned Lark that seemed very upset with me because my presence was interrupting his mating routine. Well — everything worked out just fine. 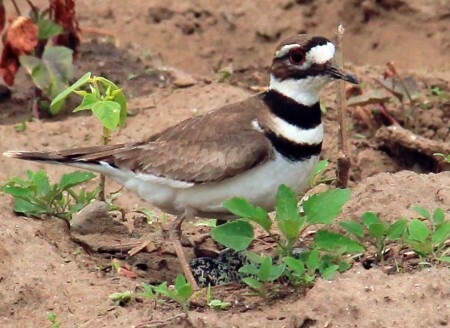 Below is Mrs. Horned Lark tending a clutch of eggs. I took this shot and moved on as quickly as I could, because I could hear the male yelling at me to “get away from her” in the distance. 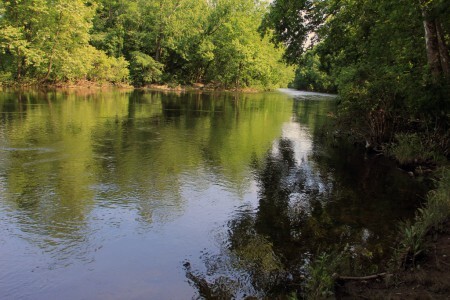 Changes in the weather increase the influence of the Farmington River in the entire area, especially the farm lands. 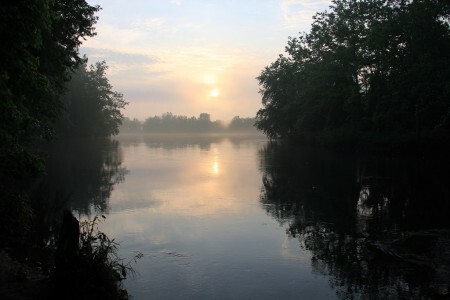 These two photos show the river at normal level for late spring. 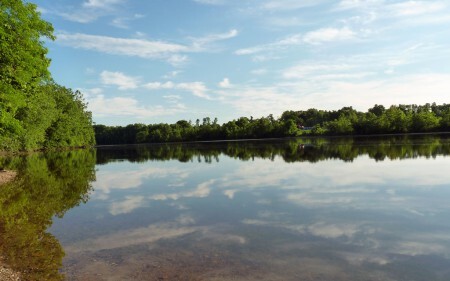 Popular locations for swimming and fishing become very active at this time. I have included, below, another photo of this spot after the the third day of rain. On the other end of that bent rod is a nice fat rainbow trout, one of about 5 or 6 that this fisherman caught while I was watching. A few days after that last photo was taken, it began to rain. It rained for the next three days. 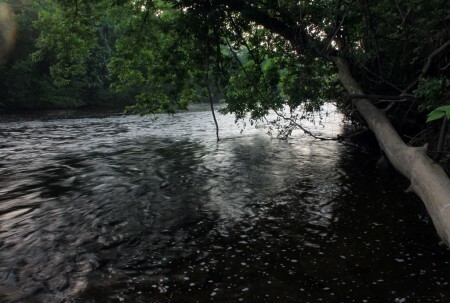 I watched as the river began to swell and flow faster and faster. On the third day the river was moving along at about 50 mph at this spot. This is what that swimming spot looked like after it stopped raining. 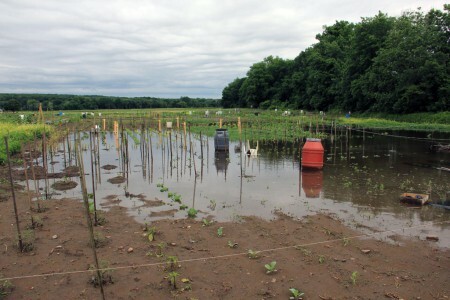 Several of the gardens that are located in low spots were flooded. At first I thought that this was Irene all over again. When I started poking around the river bank I realized that the river did not contribute to the flooding in the fields. This was all rainwater. If these plants could survive getting their feet soaked, a recovery was possible. 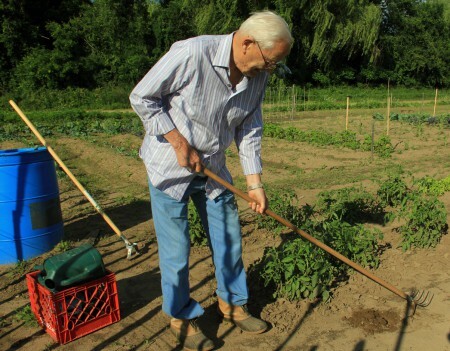 This is Charlie, a 92-year-old gardener tending a 5000 square foot plot that he planted with the help of a practicing dentist from a neighboring town. As soon the water in the road receded and the police barriers came down, Charlie grabbed his gardening tools and headed for the gardens to repair any damage caused by the rain. Luckily his garden is on higher ground and suffered minimal problems. This is Charlie’s 5000 square foot plot. This is what the four flooded gardens, shown above, looked like several days after the rain stopped. These plots are all maintained by veteran gardeners that do this primarily for the love of the craft. 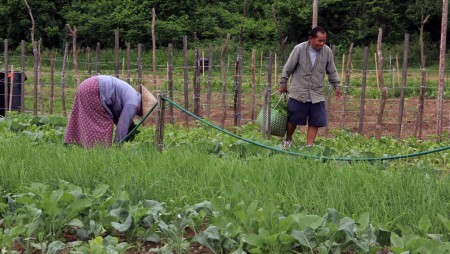 However, after talking with them, I can assure you that none of them are thrilled with planting a 2500 square foot garden twice to get only one harvest. The lady in the hat is another veteran gardener. This year she is working with her son to repair storm damage their 5000 square foot garden. I included this picture because I think it demonstrates the determination of all avid gardeners. 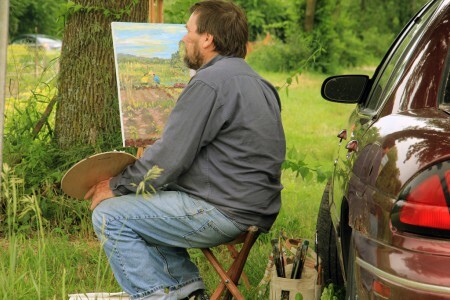 This young man is one of several local artists that appreciate the beauty of these gardens and the natural habitat that surrounds them. 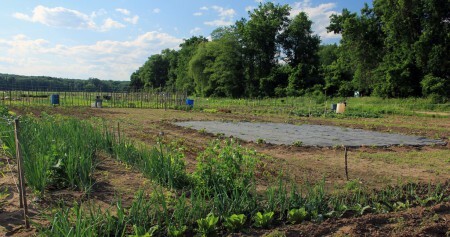 After surviving another near natural disaster, the river, fields, and gardens are once again at peace. Until the next time. There is an old Samurai chant that was taught to me years ago. 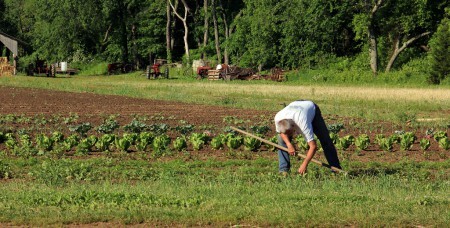 It reflects the determination and grit that farmers and gardeners everywhere apply to their craft. This entry was posted on Monday, July 1st, 2013 at 2:00 pm	and is filed under Gardens. You can follow any responses to this entry through the RSS 2.0 feed. Both comments and pings are currently closed.